Rockcliff Expands Talbot Copper Deposit Expands to 4.2Mt at 3.4% Copper Equivalent (1.6% Copper, 1.8 g/t Gold, 1.4% Zinc, 28.0g/t Silver) — Rockcliff Metals Corp.
Toronto, ON – December 7, 2017 – Rockcliff Metals Corporation (“Rockcliff“ or the “Company”) (TSX.V: RCLF) (FRANKFURT: RO0, WKN: A2H60G) is pleased to announce an updated Mineral Resource Estimate prepared by SRK Consulting (Canada) Inc., (“SRK”) for the Talbot Copper Deposit located on the Talbot Property, central Manitoba. The Talbot Property is part of the Company’s Manitoba property portfolio and is located within the prolific Flin Flon-Snow Lake greenstone belt. 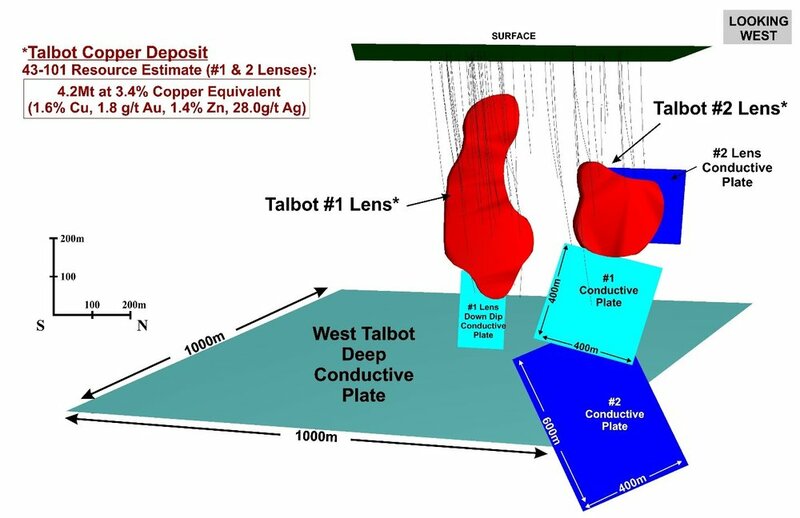 Please view the longitudinal image on the following page highlighting the location of the Talbot Copper Deposit and surrounding geophysical conductive plates. The Inferred Mineral Resource Statement prepared by SRK for the Talbot Deposit is detailed below. * Mineral resources are not mineral reserves and have not demonstrated economic viability. All figures are rounded to reflect the relative accuracy of the estimates. Composites were capped where appropriate. Mineral resources are reported at a copper equivalent cut-off value of 2% copper per tonne, considering metal prices of US$3.00 per pound of copper, US$1.20 per pound of zinc, US$1,400 per ounce of gold and US$22 per ounce of silver, and assuming metal recovery of 90% for copper, 90% for zinc, 70% for gold and 70% for silver. The numbers may not add up due to rounding. The mineral resource (“Mineral Resource”) reported herein, considered drilling information available up to July 15, 2017 and was evaluated using a geostatistical block modelling approach constrained by polymetallic mineralization wireframes. The Mineral Resource has been estimated in conformity with the CIM “Mineral Resources and Mineral Reserves Estimation Best Practices” guidelines and are classified according to the CIM Definition Standards for Mineral Resources and Mineral Reserves (May 2014) guidelines. The Mineral Resource Statement is reported in accordance with Canadian Securities Administrators’ National Instrument 43-101. Mineral Resources are not Mineral Reserves and have not demonstrated economic viability. There is no certainty that all or any part of the Mineral Resource will be converted into Mineral Reserves. The effective date of the Mineral Resource Statement is December 1, 2017. The drill hole database to support the Resource estimate is comprised of 84 core boreholes totalling 44,800 metres of drilling. Based on the current data available supporting the Mineral Resource Estimate, all material above the Mineral Resource cut-off grade was classified as Inferred. The Mineral Resource is estimated using a long-term gold price of US$1,400 per ounce, silver price of US$20 per ounce, copper price of US$3.00 per pound, and zinc price of US$1.20 per pound. An NSR cut-off value of 2.0% copper equivalent was used for reporting the Mineral Resource. The average composite thickness of the deposit was 7.14 metres. Neither Rockcliff’s Qualified Person, Ken Lapierre, nor SRK’s Qualified Person, Sébastien Bernier, nor management of Rockcliff is aware of any known environmental, permitting, legal, title, taxation, socio-political, marketing or other relevant issues that may materially affect the estimate of the Mineral Resource. The Technical Report, compiled in accordance with NI 43-101, will be filed on Rockcliff’s issuer profile on SEDAR within 45 days of release of this press release. The Talbot Property hosts the high grade Talbot Copper Deposit which is defined as a stratabound, gold-rich VMS copper deposit consisting of a single lens of coarse grain to stringer to massive sulphides of pyrite, chalcopyrite, sphalerite and pyrrhotite in a quartzofeldspathic gneiss. The polymetallic mineralization remains open in all directions and bore hole and DPEM geophysical surveys immediately outside of the known limits of the Talbot Copper Deposit Resource have identified large conductive plates that could represent additional areas with VMS mineralization. The depositional environment of the Talbot Property is similar to that of present and past producing base metal deposits associated with bi-model volcanism(felsic to mafic volcanic and volcaniclastic rocks) in the Flin Flon – Snow Lake greenstone belt. Samples of half core were packaged and shipped directly from Rockcliff’s field office to TSL Laboratories (TSL), Saskatoon, Saskatchewan. TSL is a Canadian assay laboratory and is accredited under ISO/IEC 17025. Each bagged core sample was dried, crushed to 70% passing 10 mesh and a 250g pulp is pulverized to 95% passing 150 mesh for assaying. A 0.5g cut is taken from each pulp for base metal analyses and leached in a multi acid (total) digestion and then analyzed for copper, lead, zinc and silver by atomic absorption. Gold concentrations are determined by fire assay using a 30g charge followed by an atomic absorption finish. Samples greater than the upper detection limit (3000 ppb) are reanalyzed using fire assay gravimetric using a 1 AT charge. Rockcliff inserted certified blanks and standards in the sample stream to ensure lab integrity. Rockcliff has no relationship with TSL other than TSL being a service provider to the Company. The Mineral Resource for the Talbot Property disclosed in this press release has been estimated by Mr. Sébastien Bernier, P.Geo., an employee of SRK and independent of Rockcliff. By virtue of his education and relevant experience Mr. Bernier is a "Qualified Person" for the purpose of National Instrument 43-101. Mr. Bernier, P.Geo. has read and approved the contents of this press release as it pertains to the disclosed Mineral Resource Estimate. Rockcliff can earn a 51% interest in the Talbot Property from Hudbay Minerals Inc.(“Hudbay”, HBM:TSX;NYSE). Please refer to the news release dated October 11, 2016 for specific terms of the option agreement. On November 1, 2017 Rockcliff Copper Corporation changed its name to Rockcliff Metals Corporation. The change of name better reflects the polymetallic nature of the Company’s high-grade VMS properties that comprise copper, gold, zinc and silver and its primary lode gold properties. Rockcliff is a Canadian resource exploration company focused on the discovery, advancement and consolidation of a portfolio of the highest grade, undeveloped metal deposits in the prolific Flin Flon – Snow Lake Greenstone Belt located in central Manitoba. The Company’s current portfolio of projects, totalling in excess of 45,000 hectares, is located in and around the Snow Lake mining camp and hosts some of the highest grade undeveloped NI 43-101 compliant copper deposits (the gold-rich Talbot Copper Deposit and the Rail Copper Deposit), and the highest grade undeveloped historical zinc deposits (the Lon Zinc Deposit, the Bur Zinc Deposit, the Morgan Zinc Deposit and the down dip continuation of the Pen Zinc Deposit). The Company’s properties also include Manitoba’s first and highest grade former lode gold producer (Laguna gold property), four additional gold-rich properties (SLG gold property, DSN gold property, Berry Creek gold property and the Lucky Jack gold property), a Net Smelter Royalty on the Tower property (the T-1 Copper Deposit) and the optioned near surface high grade MacBride zinc deposit located north of Snow Lake near Leaf Rapids, Manitoba.